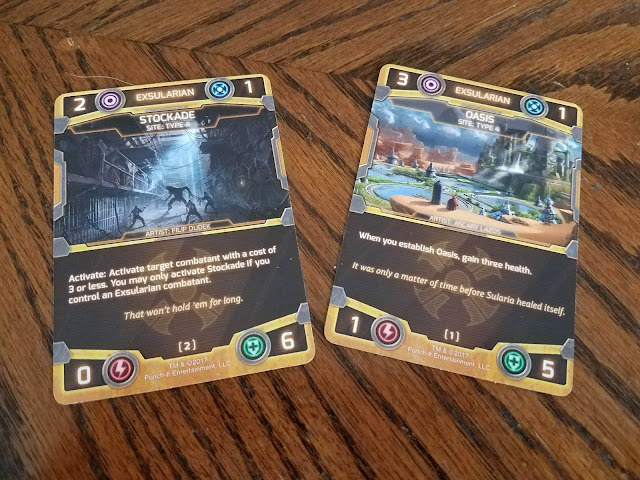 WARNING: This is a preview of the newest Battle for Sularia expansion, The Good, the Bad, and the Savage. All components and rules are prototype and subject to change. The unlucky Sularians who were deemed unworthy to join the Jotune in the safety of their bio-domes were forced into the wastes after "the Fracture." Many died, but the descendants of those who survived became strong and crafty, surviving at all costs. The remnants of society have suffered in the wastes for centuries now, and the rise of the Synthien and Protoan have pushed them to their limits. Finally fed up from a lifetime of abuse and deadly circumstances, the surviving tribes have banded together to fight against their oppressors, renouncing their former name as citizens and uniting under the title of Exsularians! While the core game featured the godlike Jotune and robotic Synthien, and Reign of Terror introduced the world to a horrible new threat in the form of the Protoan, the newest expansion focuses on a group that has been in the background since the game's first moments: the citizens of Sularia. The newest faction brings with it a new characteristic and keyword to bring a fresh style of play to Battle for Sularia. Cowboys, junk traders, and psychopaths - proud members of the Exsularian faction. 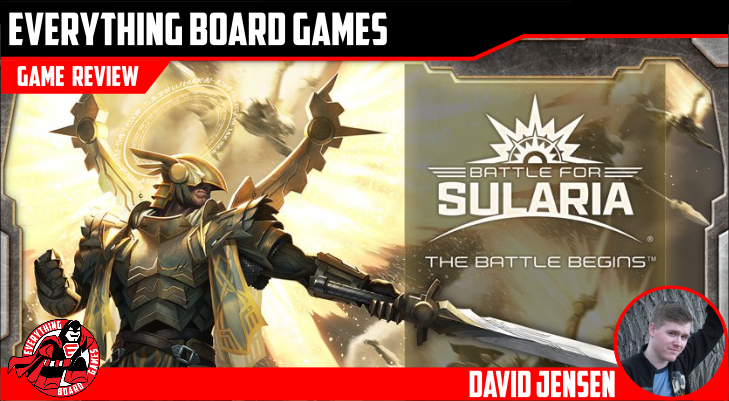 My comprehensive review of the rules and setup for Battle for Sularia can be found here. 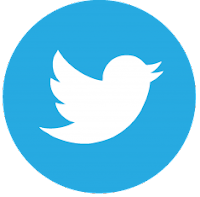 As a quick synopsis, rounds are composed of nine phases: Reset, Draw, Influence, Site, Sularium, Combatant, Attack, Discard, and End. Throughout the game, players will build pools of influence and sularium. They'll also play Site and Combatant cards in an attempt to eliminate their enemy while protecting themselves. Carefully balancing your influence and sularium generation, while also building a strong offense and defense, is the key to victory. The Good, the Bad, and the Savage is a stand-alone expansion, meaning that while its ruleset is the same, you don't necessarily need a copy of the core game to play. The expansion has enough cards for up to two players, depending on your choice of playstyle. While the themes behind the past factions have been heavily rooted in science fiction, The Good, the Bad, and the Savage takes a different path, going for a western/post-apocalyptic vibe. 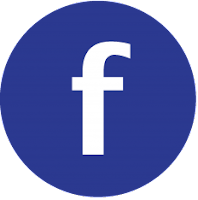 The fighters range from gunslingers and bounty hunters to mutants and scavengers. Their sites follow this same vibe, with locations including scrapyards and the ever-important cantina. The abilities at their disposal focus mostly on disrupting their enemy's plans and causing anarchy, which fits their vibe rather well and offers a unique playstyle from the other factions. The wastes of Sularia hold hidden wonders, if you know where to look. The Good, the Bad, and the Savage also brings a new keyword to the table: Preemptive. This keyword allows the Exsularian player an advantage should they be the off-initiative player, modifying their threshold cost to allow for certain cards to be played earlier than they would normally be. Not only is this the first time that the off-initiative player has been given a bonus, but it also plays off the concept of the underdog going up against the stronger and better-equipped enemy, excelling when they're at a disadvantage. 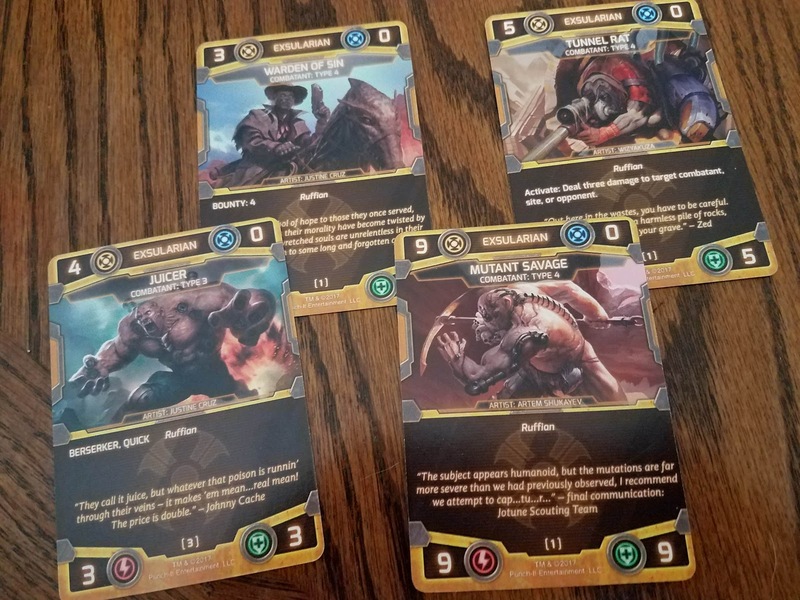 The expansion also makes use of existing keywords - particularly Bounty, Quick, and Berserker - to provide a well-rounded group of combatants, as well as a new characteristic (Ruffian) to further define some of the faction's seedier individuals. Similar to the Warrior characteristic from the first expansion, the many Ruffian cards are used in conjunction with a single, higher level card - in this case, the "Headhunter" Combatant card, who can select a card from the deck and play it for free. Considering the cost of certain Ruffians, this ability can be used to turn the tide of battle. Some of the various "ruffians" you may come across on your journey. We had the chance to play a handful of games, with the Exsularians trying their hand as both the initiative and off-initiative player. When on the initiative, the Exsularians were still a very capable threat - their ability to take punches, circumvent their opponents' plans, and generally wreak havoc made them a force to be reckoned with. When playing as the off-initiative player, however, the disadvantage of going second (and therefore having to react to their opponent's actions) was balanced by the use of their cards bearing the Preemptive keyword. While only present on a handful of cards, it meant that "clutch" cards could be played earlier than they would have otherwise been able to, allowing the Exsularians to get themselves back into the fight and give their opponent a run for their money. As with the core game and expansions, The Good, the Bad, and the Savage has several guest artists that each brings their own flair to the world of Sularia. I'm constantly impressed with the striking detail in the cards, as well as the fact that each artist's unique vision ties together with everyone else's art, making the cards feel like they belong together. This expansion contains 100 Exsularian faction cards (25 unique cards with four copies of each card), as well as four of a new Mercenary card. 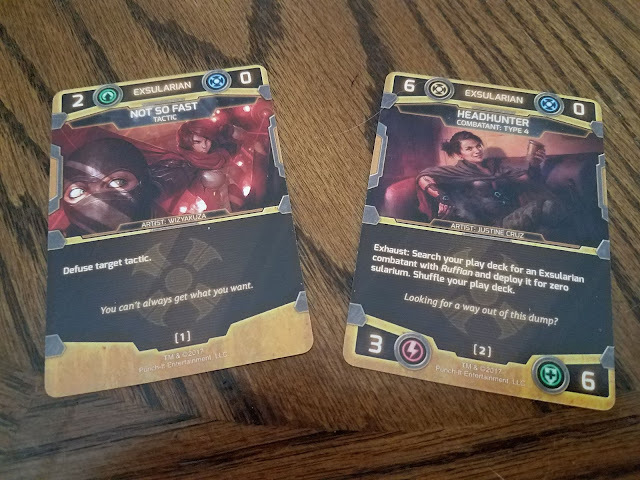 The card quality lines up with that of the core game and its expansions, so there's nothing to complain about there. There was not, however, any sort of instructions or rules reference for this expansion. This may well have been due to my copy being a prototype, but if such an instruction guide exists, I cannot personally comment on it. The cards keep the core game's layout and impressive artwork, changing the background color to help distinguish factions. All told, The Good, the Bad, and the Savage is a perfectly respectable addition to the Battle for Sularia franchise. 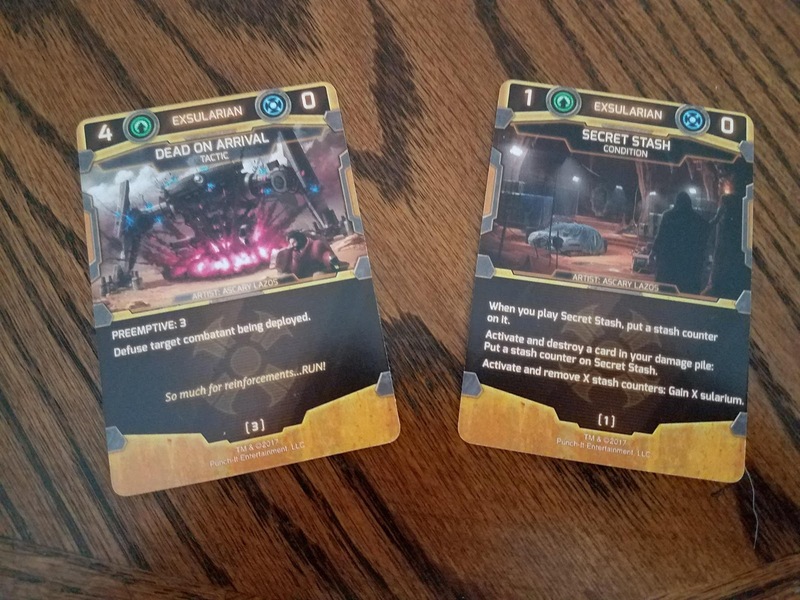 The Exsularians bring a fresh way of playing to the table, providing both opportunities for players to expand their tactics and for their opponents to further develop strategies for unique threats. The Wild West/Mad Max vibe has been absent from the game thus far, and it fits into the world like a crucial puzzle piece. Honestly, there's not much to be upset about here. 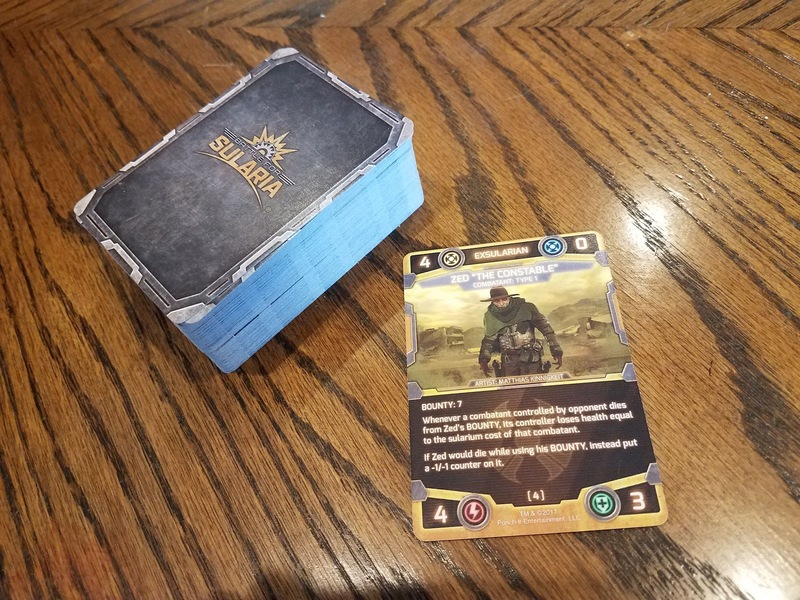 Outside of the expected pitfalls of most battle card games (a necessity for tokens to track influence, sularium, and health, which are not included with the game), the expansion stands strong alongside the rest of the Battle for Sularia games. It's definitely a must-have for those who already enjoy the core game and are looking for their first expansion. It's nice to finally see the Exsularians, who have been a part of Battle for Sularia since the beginning, finally get a chance to take center stage! Fans of the Battle for Sularia series, as well as those who enjoy other card battle games like Magic: The Gathering, will likely find this a fun addition to the table. The Good, the Bad, and the Savage can be preordered here. As a comment on the Ruffian card type, Headhunter does interact with it, she allows you to search your deck for a ruffian and put it into play.